Given the headlines, questions, and legal actions Google has faced recently, many folks, including myself, have been wondering when Google’s CEO Larry Page would take a more public stance in outlining his vision for the company. Well, today marks a shift of sorts, with the publication of a lenthy blog post from Larry titled, quite uninterestingly, 2012 Update from the CEO. – Page pushes Google+ as a success, citing more than 100 million users, but still doesn’t address the question of whether the service is truly being used organically, rather than as a byproduct of interactions with other Google products. I’m not sure it matters, but it’s a question many have raised. He also doesn’t address, directly, the tempest over the integration of G+ into search. – Page also does not directly address the issue of FTC privacy investigations into the company, not surprising, given any company’s response to these investigations is usually “no comment.” However, Google might have explained with a bit more gusto the reasons for its recent changes. – Page tosses out another big number, this one around Android: 850K activations a day. Take that, Apple! – Page uses the words “love” and “beauty” – which I find both refreshing and odd. – Page also talks about making big bets, focusing on fewer products, and how it’s OK to not be exactly sure how big bets are going to make money. This is a topic where Google has a ton of experience, to be sure. More when I get out of my last meeting…. think you have—I mean, what does it really mean to be a search company? Articulate and crystal clear … ain’t it, guv. I couldn’t believe what Page said about Steve Jobs and that he was using his remarks re: Jobs making such a big deal about Android being a rip-off of Apple was just for show. I’m betting that this comment will haunt him for some time (and an illustration of his cognitive dissonance or of mine). I noticed you (JB) removed your central response which was that, to paraphrase, you didn’t need that sort of search but rather liked the idea of simply going to the library and looking up disparate information yourself. Indeed that comment was bizarre and obviously detrimental to so many who want to make billions of pieces of important information about our world findable and actionable- to make us all more knowledgeable. I’m glad you removed your comment as really it is a million miles away from the Wired universe you dream(t?) about. Poor loves. Trained to Empire, trained to rule the waves. All gone. My Home Page: freely accessible to everybody. have been deliverd in class and revised accordingly. I never take stuff down. Odd. I’ll ask my team. Generally, I’m very curious about how successful founders/leaders convey their message to inspire the faithful. I certainly don’t know enough about the inter-workings at Google but from the outside looking in, it appears to me, this message was assigned to reassure the troops and the community, everything is going to be all right! Perhaps we all need a little reassurance; I’ve personally debated whether the magic times are behind them. Google is locked into several high-stake battles, fighting for possession and rule of large market empires. Today, I believe the keys to success require more than building technical integration, you also need invisible assets – do things and make things so great, that people will love you for it! 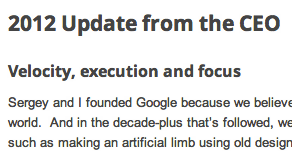 There’s a several sections in Larry’s letter devoted to this overture; which signals to me, that Google is now on a more profound level, refocusing on quality – building measurably better products, services and benefits for users in the future. Time will tell, but I like the message – be focused, more narrow and just do great things! Ha! Go watch footage of MS Execs bragging about their marketshare like 10 years ago. They don’t sell PCs just like you don’t make phones. Other people do with actual Hardware Designers, and actual sales channels do. You guys bought a company that repackaged Linux*. Apple makes about $500 off each phone and tablet they sell. Google doesn’t sell anything except advertising. (*Note: Lest we forget, the resurgence of Apple goes back to a 1997 purchase of NeXT by Apple. NeXT repackaged UNIX into NeXTSTEP, which became OS X, which later became the basis for iOS). Take that Larry: you graduated as the country’s eminent computer scholars, and now you run the worlds biggest advertising company. And that’s why you have to come out and beg people to ‘love’ your company. Your Google+ is a pathetic Facebook ripoff, as is your Android (iOS) and GoogleTV (AppleTV). Let’s not even get into the whole Android Tablet debacle. Oh yeah, one more thing, “Don’t be Evil”.. I know it’s hard, but let’s see if you can go just a day or two without doing anything evil. While you look for your comment (I think we have a copy of it somewhere) about the need for deeper search (or no need for it?) …I ask you and others here why can’t I read my copy of the wall st journal like I just did yesterday morning and simply ask a deep question in relationship to a good story I have read? When I ask a simple question on google such as “is the fed ready to launch new measures” why on so many of these questions do we get such meager results? Wouldn’t better results look like this? I ask you don’t you think we need more advanced search engines? Others here? guarded—assessment of the economy’s performance. in an effort to push down already low long-term interest rates. necessarily represent the opinion of FXstreet.com or its management.